Creator of what generally as the most fine acoustic guitars in the world is considered. More than one hundred fifty years, the company that distinction through dedication and professionalism its founder Christian Frederick Martin retained. Christian Friedrich Martin, born January 31, 1796 in Markneukirchen, Germany the son of Johann George Martin. Johann George Martin was a carpenter who is also proficient in building violins. Christian also felt strongly attracted to building music instruments. At age 15 Christan Friedich was apprenticed to the Viennese violin and guitarbuilder Johann Stauffer. Soon he showed much talent and was appointed by Stauffer to master servant. After this learning school he returned to Marneukirchen and opened with his father a own little construction company in violin and guitar. The success they had was a thorn in the view of the guild builders in the region. (That they had to compete with an ordinary carpenter). After all harassment Christian decided to emigrate to America. At the address 169 Hudson street in New York, he started in 1833 a guitar shop and founded C.F. Martin & Co. New York remained a strange and impersonal environment for the guitar builder from Germany, and therefore Christian decided in 1839 to move to Cherry Hill close to Nazareth, near Philadelphia. 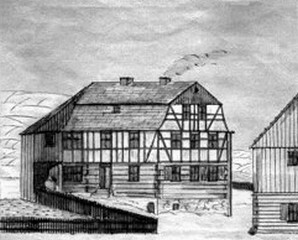 The first factory was next to his house. And from 1839 to 1850 his instruments were sold through a New York agent at 385 Broadway. After 18 years lived in Cherry Hill have bought Christian a piece of land near Nazareth. Because the connections and transportation were much better. In 1859 he settled there with his family on the corner of Main and North Street. It soon built the company, which then consisted of only six people, 200 guitars a year. February 16, 1873 Christian Friedrich Martin died at age 77. His son Christian Friedrich Jr., continued the company. After nearly thirty years they had successfully worked, could C.F. Martin jr plant in 1887 spread to twice its original size. Christaans Jr. son Frank Henry, was head of the next generation. Frank Henry was also a smart businessman, who hit from the currency greatly increasing popularity of the banjo, ukelele and mandolin. The reputation the company had already built up, spread this even more. Around 1890 Martin had 15 professionals in service. 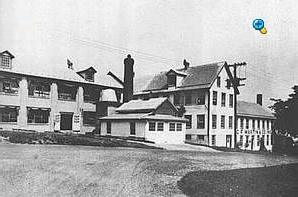 To meet the growing demand, Frank expanded the factory in 1917, 1924 and from 1925. The number of employees increased to 75 and the year production to 3000 instruments. In 1960, amounted the production to 5000 instruments and that made the purchase of a extra factory necessary, that was taken in use in 1964. In 1970 the factory was expanded again to its current size of 21,000 m2 and accommodates approximately 250 employees. Every year over 25,000 instruments leave the factory and traditional tools are still made by hand. But now there is also equipped with environment-monitoring equipment, which prevents it the wood will shrink. The humidity of the air is thus between 35 and 45 percent and the temperature between 22 and 25 degrees held. Influenced by the work of Johann Stauffer were the first guitars Johann Christian Martin in the middle strongly 'waisted' and were the machine heads (tuners) on one side of the head affixed. The 18th century guitars are fairly small, but in 1917 Henry Frank and an employee designs music publishing Ditson, together a new guitar with a large enclosure. In the bottom of the enclosures was "Oliver Ditson Co. Boston, New York" pressed and the guitar was named "Dreadnought" named after the British Navy ship that ran in 1906 stack. From 1931 the name 'Martin' pressed in the Dreadnought. (Dreadnought is often written as Dreadnaught). The 1917 catalog contains six models plus a audiorium model of 38 cm wide, which only order was delivered. The prices of guitars ranging from $25,00 for the R-18 to $110,00 for the O-45. The first Martin with a fourteen frets neck was the O-28, which was introduced in 1929. The first models with a twelve frets neck, the D-18 and D-28 appeared in 1931 and the first D-28 (fourteen frets) in 1934. In that year the first 'T-bar' rod-neck guitar in No. 57305 installed. One of Martin's finest and best guitars, the D-28 Herringbone, were between 1933 and 1946 1800 copies made. 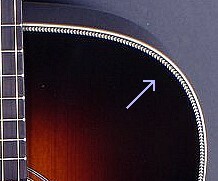 In 1931 Martin released the C1 model, an arched-top with a different with round resonance hole. Two years later they replaced it by a model with F-holes. This model was built until the model in WOII, because of material shortages, could not be made. 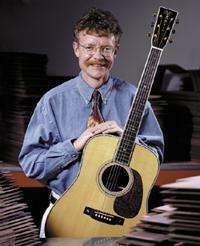 Martin was on the market with both acoustic and electric guitars. The OO-D-18E and 28E appeared in the period 1959 to 1966 and the D-18th from 1959 to 1962. Electric arched-top guitars with F-holes were released between 1962 and 1968, including the F-50, F-55, F-65, GT 70, GT 75 and GT-75-12. The absolute top of the series is the Martin D-45. This guitar looks great and sounds even better. The first D-45 was built in 1933 specifically for Gene Autry and five years later became the official catalog. Until October 1942 there are 91 D-45 guitars built, the production had to stop because the war. In 1968 the D-45 was re-released as much demand for the guitar remained. Currently, a D-45 costs around $14,000 and is one of the most expensive guitars. The guitars that made for 1898 are known as the New York Martins. Since 1898 'C.F. Martin & Co., Nazareth, Pa' on the inside of the soundboard printed. To be able to guitars dating from 1898, Martin serial numbers affixed. The numbers start with the number 8000, which roughly indicates how many guitars were built there for that time. From 1986 C.F. Martin IV (Chris) now in control. Chris was born on July 8, 1955 and studied economics in the 70s. From 1986 C.F. Martin IV (Chris) now in control. Chris was born on July 8, 1955 and studied economics in the 70s. In his spare time, he helped in the guitar repair of Music Westwood in West Los Angeles, and this gave him a valuable insight into retail. As a little boy he helped at home in the factory with the packaging of the guitar strings. In 1972 and 1973 he was active in the business and worked at the office of his father and cared the music stands at fairs. 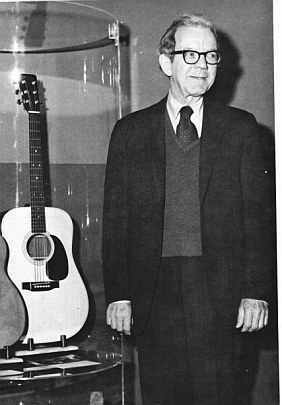 In 1973, he assist in the development and construction of the D-28S guitar. This and his apprenticeship in the shop was an invaluable experience when he place occupied in the family business. After studying 'Science in Business Administration' works Chris full time in the company. Chris worked in various departments and learned as the business from the bottom to know. In 1985 he was appointed Vice-President of Marketing. After the death of his grandfather, C. F. Martin III, on June 15, 1986, was C. F. Martin IV appointed President of Board and CEO, indicating its responsibility for the company to lead the coming decades. Perhaps the most daring new direction Chris took was the development and introduction of the patented "1 Series" guitars, which are designed and thoroughly research back built. By using innovative processes combined with computer technology, the models of the "Series 1" now an affordable acoustic guitars without compromising quality and craftsmanship.